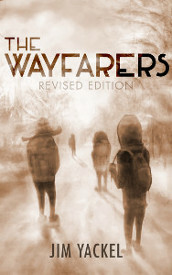 The Wayfarers puts its first step forward with Walking Dreams, paces off the miles in Five Feet From the Cabin Door, and culminates with Jacob’s Trouble. An intriguing cast of characters that could even be you and your neighbors and friends take both together and separately an unintended journey seeking safety, security, and answers as an America in sudden crisis and the entire world spins out of control into the biblical End of Days. As these individuals are pulled into a natural and supernatural battle against powers, principalities and the rulers of dark places, could they all survive and make it to that place of safety and security? As you survey a radically-changing world today, are you seeking that same eternal refuge? Are you ready to take the walk? He’s a bright, industrious, and creative man whose world is falling down around him as his very life has become imperiled. As he teeters on the precipice of total breakdown; an automobile’s mechanical failure forces this man without an address to begin a walk that was intended to take him to his place of lodging – but would he ever make it there? What colorful and potentially impactful individuals would he meet while on his unplanned walk? Six months after America’s worst day – that being a wave of terror attacks on the east coast – the nation has fallen to its knees. The Christian Church has been raptured, or were the UFO’s in the sky an indicator of a massive alien abduction instead? The U.S. Dollar is on the verge of collapse as rioting and looting mar the streets of the country’s population centers and Martial Law is still in effect – but there are some new sheriffs in town and they are bent on taking over the traditional means of enforcement. Television and radio are being controlled and only one network is left to report the news of the world. It seems that even the weather forecasts are being massaged!